More nails in the Republican coffin? For a number of years now, I have watched part of the Republican party that has as its main, if not sole, purpose, to dismantle government. 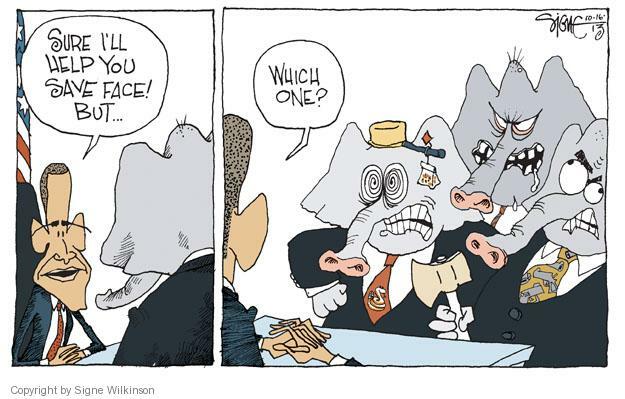 They called the Democrats bluff with the sequester which so far has appeared to have little effect. Who cares if a military base can’t afford fireworks or if the Blue Angels can’t afford to do a fly over? In the big scheme of things, those are pretty unimportant. But now more and more federal workers are being furloughed. For example, local HUD (Housing and Urban Development) offices are closing for five Fridays in July and August. That is 5 Fridays that staff will not be paid. This is money that won’t be spent on a vacation or for car repairs or for food and clothing – all things that add to the economy. (Here is an interesting website that tracks furloughs.) And while a number of agencies have figured out ways to avoid furloughs, many workers will still be affected – still more if Congress can’t manage to pass a budget for the fiscal year that begins in October. The loss of incomes will slowly begin to mount. But it isn’t just the failure to produce a budget. A recent New York Times editorial summed up the issue quite neatly. They called it a refusal to govern. On two crucial issues this week, the extremists who dominate the Republican majority in the House of Representatives made it clear how little interest they have in the future prosperity of their country, or its reputation for fairness and decency. The two issues are immigration reform and the removal of the food stamp program for the House agriculture bill. These actions show how far the House has retreated from the national mainstream into a cave of indifference and ignorance. House members don’t want to know that millions of Americans remain hungry (in an economy held back by their own austerity ideology), and they don’t want to deal with the desperation of immigrant families who want nothing more than a chance to work and feed themselves without fear of deportation. On both issues, in fact, many House Republicans are proudly asserting that they will stand in the way of any attempts to conduct a conference with the Senate. That might, after all, lead to a compromise. And it isn’t just in the House. Few things sum up the attitude of the current crop of Republicans in Washington than their loathing of conference committees. On issue after issue, they have passed radical bills and then refused to negotiate. On Thursday, for example, Senate Republicans refused for the 16th time to allow the Democratic Senate budget to be negotiated with its dangerously stingy counterpart in the House. On immigration, House members fear a conference with the Senate would add back the pathway to citizenship that they consider a giveaway to undesirable non-English speakers. The eventual House border bills “should not be handed to a conference committee so that they can be reconciled with the Senate bill,” wrote Representative Tom Cotton of Arkansas in The Wall Street Journal on Thursday. Instead, he and others say, the Senate should be forced to take up whatever the House produces. Senate Minority Leader Mitch McConnell may believe that ending the filibuster with a majority vote will spell the end of the Senate and cause Harry Reid to be remembered “as the worst leader of the Senate ever”, but in my opinion, the continuous use of the filibuster has already come close to destroying the Senate. Everything should not require 60 votes. A refusal to even to sit at a bargaining table is another way of refusing to govern. The nation’s founders created two chambers for a reason, but Republicans, in their blind fury to harm the least fortunate, are forgetting even those fundamental national values. 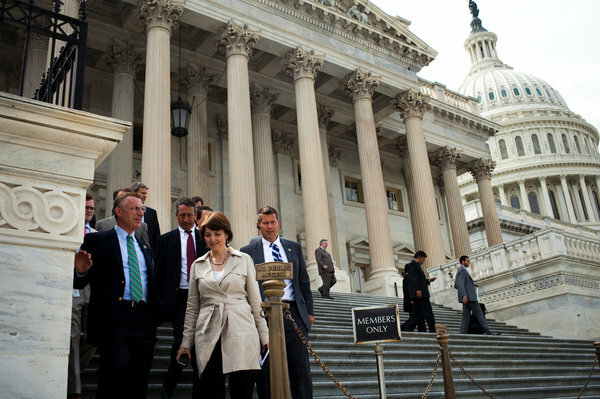 From left, Representatives Tim Murphy, Mark Sanford, Cathy McMorris Rodgers and Sean P. Duffy, all Republicans, after the House approved an agriculture bill. This is why the most recent Quinnipiac poll shows that while 53% felt the President was doing too little to compromise with Congress, a whopping 68% felt the Republicans leaders in Congress were doing to little to compromise with the President. And everyone thinks Congress is dysfunctional blaming both parties. There is something called the greater good and I think many in Congress, particularly Republicans, have forgotten that ideal. Winning Progressive had a very interesting and thoughtful post this morning by NChrissie B. 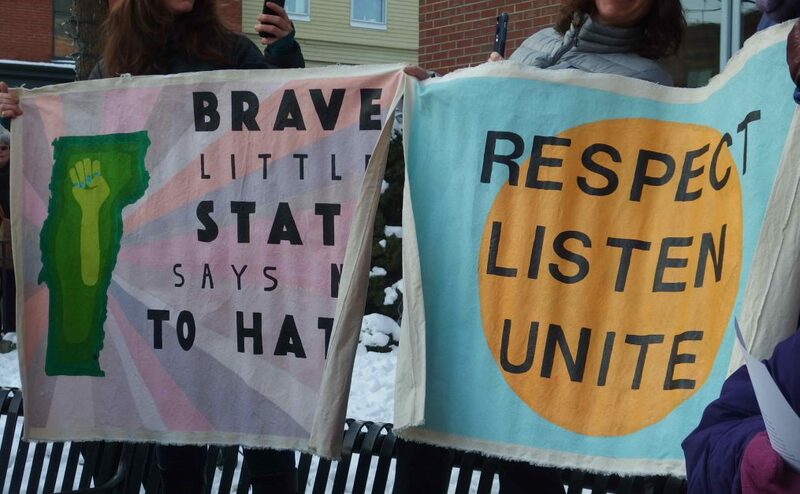 We need political fringes because that’s where most new ideas begin. Many will be bad ideas, like the House Republican Budget’s plan to turn Medicare into a voucher program. Others will be good ideas, like the financial transactions tax in the Congressional Progressive Caucus “Back to Work” Budget. As the Economic Policy Institute report noted, that tax would “raise significant revenue while dampening speculative trading and encouraging more productive investment.” It would also discourage individual investors from day-trading and other mistakes that churn their savings into brokers’ profits. New ideas tend to start on the fringes – right and left – because the fringes don’t have to govern. Think tanks, academics, pundits, and bloggers can kick around ideas without worrying about whether the ideas are politically viable. We did that at BPI when we discussed a Guaranteed Basic Income, an idea from and still on the political fringe. We didn’t talk about whether it could pass in the House or Senate. It couldn’t, at least not soon. But it might gain traction in some form, at some point, and such discussions open our eyes to other perspectives on work, wages, and the social safety net. I wrote in my unpublished dissertation that social movements need racial fringes to make the movement look mainstream. NChrissie B. is arguing that the same is true of legislating. The danger, however, is that the Democrats ignore their progressive or left wing while the Republicans are ruled by their right or Tea Party wing. This is where we seem to be right now and nothing is functioning. We need to get back to a place where there is a middle ground. NChrissie B. uses the Overton Window as an illustration. I’d like to see the window moved a little more to the left and I think that could happen if Harry Reid would just fix the damn filibuster rules. I also think the Democrats (and President Obama) need to take the Progressive Caucus budget a little more seriously than they do. It would also help if Mitch McConnell grew a backbone. 2012 was a pretty good year for those of a progressive/liberal political point of view and Winning Progressive has compiled a good summary. You can read the entire article here, but I’ve pulled out some of my particular favorites – in my own order of significance. First I have to talk about Mitch McConnell who not only lost his effort to make President Obama a one-termer, but last night voted to increase taxes. (Although since it happened after we technically went off the cliff at midnight, he will probably spin it as a decrease.) I think he an John Boehner were the big losers last year, not Mitt. Mitt is done with politics, but McConnell and Boehner have to continue to try to herd their Republican members and get re-elected. So now to some accomplishments. * President Obama Re-Elected With A More Diverse and Progressive Congress– The November elections saw the re-election of President Obama and the election of four new progressive U.S. Senators – Mazie Hirono (D-HI), Elizabeth Warren (D-MA), Chris Murphy (D-CT), and Tammy Baldwin (D-WI). In addition, Joe Lieberman (I-CT) is finally leaving the Senate! On the House side, the Democrats elected in November will be the first major party caucus in US history that is majority female and people of color. New House progressives will include Alan Grayson (FL-09), Jared Huffman (CA-02), Dan Kildee (MI-05), Ann McLane Kuster (NH-02), Grace Meng (NY-06), Patrick Murphy (FL-18), Rick Nolan (MN-08), Mark Pocan (WI-02), Raul Ruiz (CA-36), Carol Shea-Porter (NH-01), Mark Tacano (CA-41), Hakeem Jeffries (NY-08), and Kyrsten Simena (AZ-09). On the flip side, tea party conservatives Allen West (FL), Chip Cravaack (MN), Bobby Schilling (IL), Roscoe Bartlett (MD), Ann-Marie Buerkle (NY), Francisco Canseco (TX), and Joe Walsh (IL) were all defeat and, hopefully, will never be heard from politically again. * LGBT Equality– 2012 was, of course, a banner year for advancing LGBT equality. For the first time in US history, equality was supported by a majority of voters facing ballot proposals approving marriage equality in Maine, Washington, and Maryland, and refusing to ban equality in Minnesota. The first openly lesbian U.S. Senator, Tammy Baldwin (D-WI) was elected in November as were a record seven openly-gay House members. President Obama publicly supported marriage equality, and anti-equality forces in Iowa failed in their effort to recall a state Supreme Court justice who declared that state’s ban on marriage equality unconstitutional. In February, a federal appellate court ruled California’s anti-marriage equality Proposition 8 unconstitutional, and two federal courts in 2012 did the same with the Defense of Marriage Act. * Health Care Reform – In a decision that surprised many commentators, the U.S. Supreme Court upheld the Patient Protection and Affordable Care Act, aka “ObamaCare.”And while the GOP-controlled House has voted at least 33 times to repeal ObamaCare, President Obama’s re-election in November virtually guarantees that will never occur. In implementing ObamaCare, the Obama Administration, standing up to strong opposition from conservative religious organizations, finalized rules requiring that contraception be included as a preventive health service that insurance policies must cover with no co-pay. This will help millions of women afford access to birth control and also save money by reducing unintended pregnancies. Those are my personal big three. Yes, there is a lot left to do and a lot that happened that I didn’t particularly think was terrific, but on the first day of a new year, we should celebrate our successes! 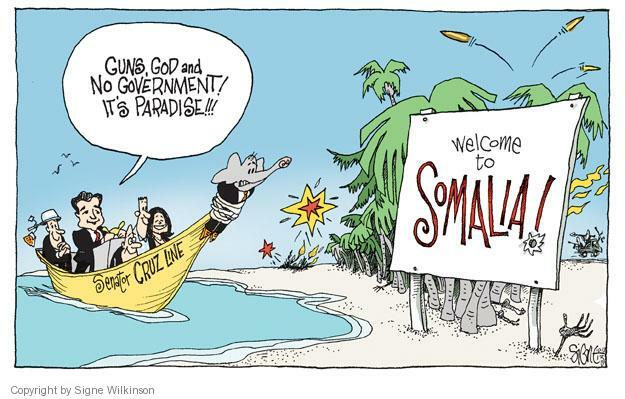 The Senate is back in town with very unhappy members who would rather be kicking back at home and who can blame them. Senator McConnell who really, really doesn’ t want to make a fool of himself a la Boehner and Plan B, keeps asking for a proposal from the President. I thought the President had made at least two proposals, but I guess Mitch doesn’t follow the new much. Meanwhile the House is called back into session on Sunday night. That is the night of December 30 a little more than 24 hours before the cliff. So what is going on here? Not being an economist, I can’t explain it all but I have found a couple of things this morning that have given me some things to think about as we play chicken with the deadline. First is this handy chart from the New York Times from the Debt Reckoning blog. It was posted last night with this explanation. The deadline for resolving the pending fiscal crisis is less than a week away and, absent a breakthrough, spending cuts and tax increases on every income level will go into effect on Jan. 2. During their negotiations, President Obama and Speaker John A. Boehner have sought to keep tax rates at their current level for some taxpayers while letting them rise for high earners, but they have not agreed on where to set the income threshold. Mr. Obama has called for rates to go up on income above $250,000 (he later increased his offer to $400,000), Congressional Democrats have said they would agree to $500,000, and Mr. Boehner has called for a $1 million threshold. 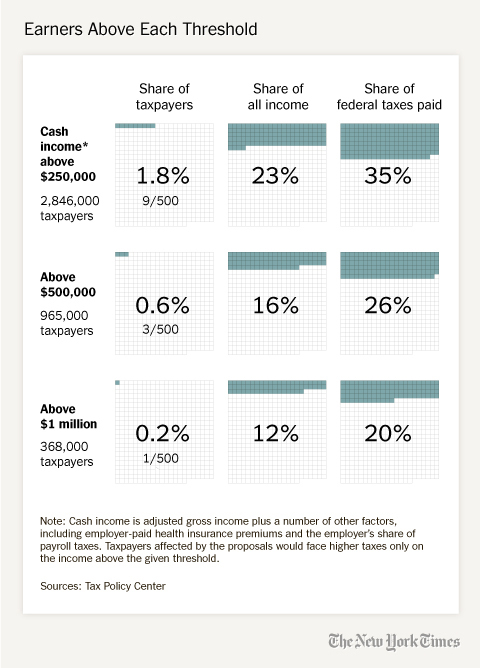 So we aren’t talking about a lot of taxpayers here since the vast majority of us make under $250,000 in taxable income. As I understand it, none of these proposals would impact investment income. (Which as we have learned from Mitt Romney, is taxed differently.) But we do pay a lot more taxes than just income tax and if we go over the cliff, these will go up. Payroll taxes, business taxes, various tax credits like for child care, and unemployment insurance will all be affected. The other thing I read this morning is from the Washington Post’s Wonkblog, They have put together a set of very helpful Frequently Asked Questions – with answers. And since this is Ezra Klein and company, there are a couple of helpful graphs. Next question: What matters most? 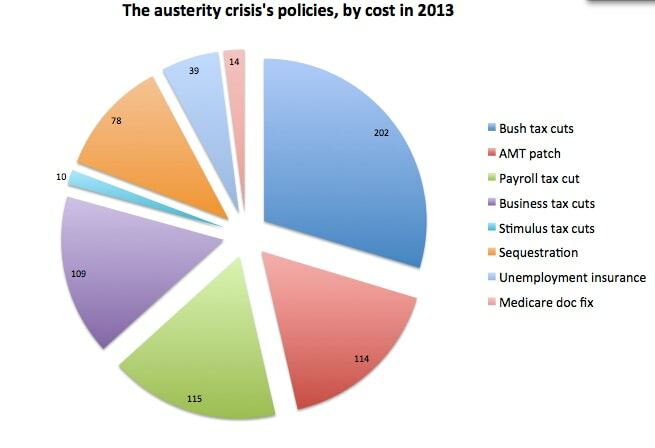 It’s important to recognize that the austerity crisis is a collision between deficit reduction and stimulus. The good news is that if you look at the various components of the fiscal cliff separately, you’ll see that the parts that do the most for deficit reduction do the least for the recovery, and vice versa. This suggests the possibility of “a la carte” approach to the fiscal cliff, in which we extend the most stimulative policies and wave goodbye to the most costly policies. And if you’re looking to go a la carte then here, via the Economic Policy Institute, is the menu. 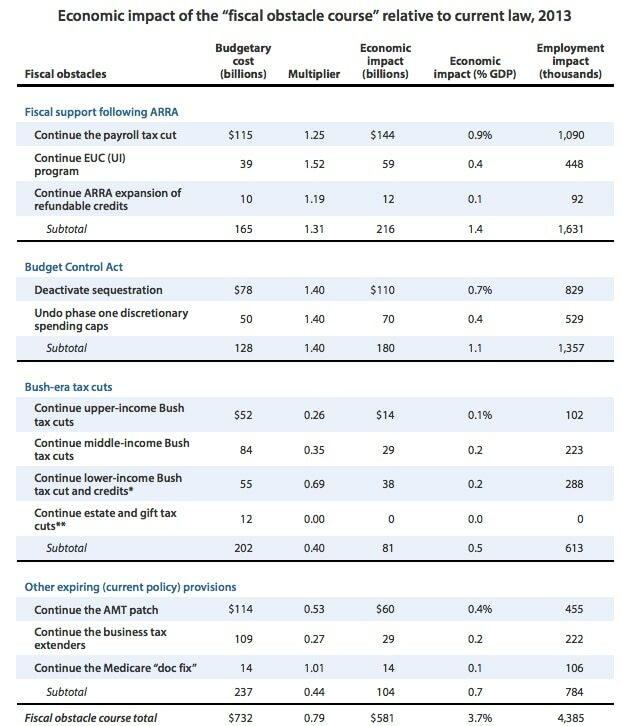 I recommend that Senator McConnell take a look at this list and the chart showing the impact of various tax increase proposals, pull out his own calculator and make a proposal. Of course given the House and Senate rules, we will probably go over the cliff before anything can be passed. I think that Mitch McConnell has just helped out the Senators who are looking to reform the Senate rules. In a bit of parliamentary squabbling common only to the United States Senate, the chamber will not be voting Thursday on President Obama’s proposal to largely shift responsibility for raising the debt ceiling from Congress to the White House. Senate Minority Leader Mitch McConnell (R-Ky.) proposed an immediate vote on the idea Thursday morning, as a way to highlight potential Democratic unease with the idea. This afternoon, Senate Majority Leader Harry M. Reid (D-Nev.) called that bluff, asking to proceed to immediate vote on the measure. But he asked for an up-or-down vote, allowing the Senate to skip to a final vote by which the measure could be approved on a simple 51-vote majority. McConnell countered the measure should require a 60-vote majority, as most votes do in the Senate. 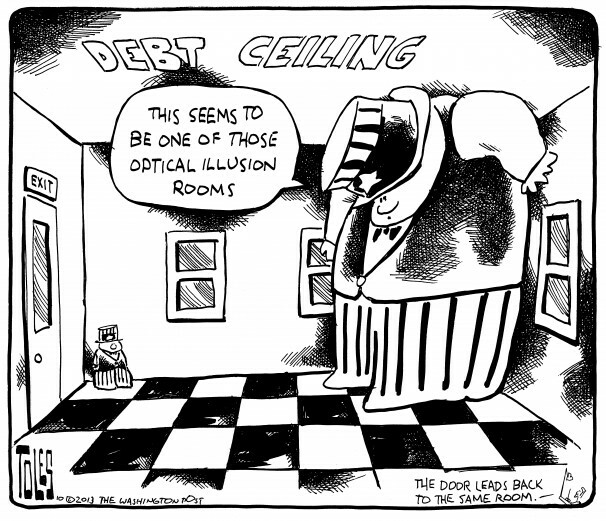 “What we’re talking about here is a perpetual debt ceiling grant, in effect, to the president. Matters of this level of controversy always require 60 votes,” McConnell said. It really is time to go back to majority votes except on treaties. Back in 2010, I wrote about the filibuster in a post called “Puppies, Cats and Filibusters“. In it I argued for the talking filibuster. It didn’t seem at the time that there was any real move to do away with it totally, but making someone actually show up and explain why while holding the floor and appearing on C-SPAN seemed reasonable. It has only taken a few years, but it looks like Harry Reid and a number of Senate democrats are moving toward a similar solution. I am still waiting, however, for a clear explanation of how exactly the change could be accomplished. Here is what I understand so far. It usually takes 67 votes to change Senate rules, but there is a mysterious thing called the “nuclear option” where the rules could be changed with only 51 votes. We know there are 53 Democratic senators and 2 who will caucus with them at least one of whom (Saunders, VT) should be voting with Reid on this.) So there are probably enough votes if there is some party solidarity. But how does that “nuclear option” work? That is the question. Senate Republicans have refused to let scores of bills go forward in recent years, often because Mr. Reid will not allow the party to put amendments on those bills. This practice is deplored by the minority in both chambers, but only in the Senate can bills be stopped through the minority protest. Mr. Reid would like to limit what procedural motions are subject to filibusters, and to force senators to return to the practice of standing around forever, reading the phone book or what have you, if they choose to filibuster a bill before its final passage. Now, Reid, at the time, was steadfastly opposed to changing the rules with 51 votes. He condemned the idea as “breaking the rules to change the rules.” So McConnell isn’t the Senate’s only inconsistent member on this point. But the fact is that McConnell was right the first time: The reason that Republicans believed they could change the rules with 51 votes in 2005 and Democrats believe they can do the same today is that they can. So I guess it really is a constitutional not nuclear option to change the rules by a simple majority. And the changes being proposed are pretty modest. Basically you could only filibuster final passage of a bill, not bringing it to the floor at all. The Republicans seem to want to amend bills and I think this is OK, but there has to be acaveat that any amendment must be related to the actual substance of the bill. Room for some compromise here? But if you want to know what this is important at all think about all the judges being held up, all the bills that don’t come to the floor of the Senate because someone (and we currently don’t have to know who) decides they want something to come to a vote. *The minority party of the 107th Congress changed multiple times. 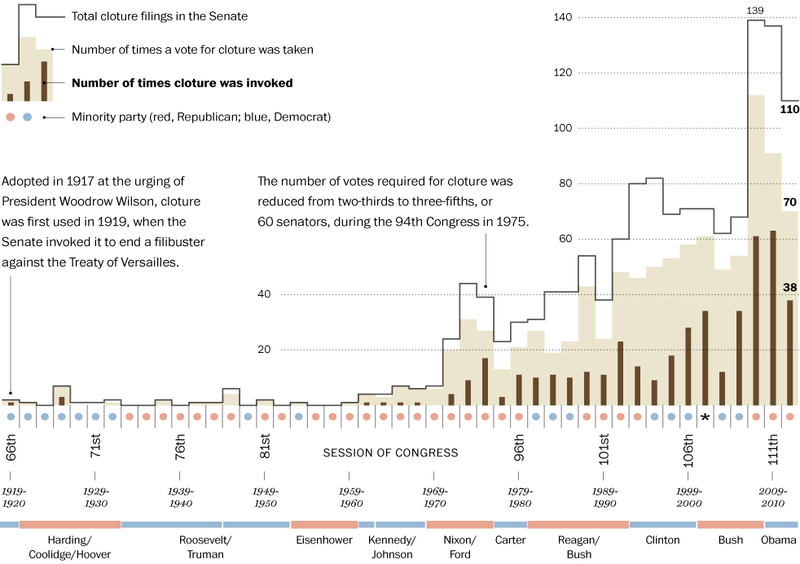 Source: United States Senate. The Washington Post. Published on November 27, 2012, 8:35 p.m. So we do have a problem here. 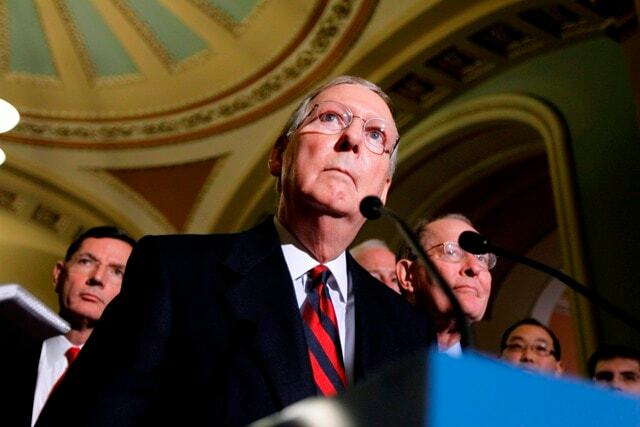 The question is whether it can be fixed or if the Senate will continue to be dysfunctional. I would actually look forward to seeing John McCain or Tom Coburn or some other Republican Senator on C-SPAN holding forth at length explaining opposition to a measure. Then we could all call our own Senators in either support or opposition. Could be fun.